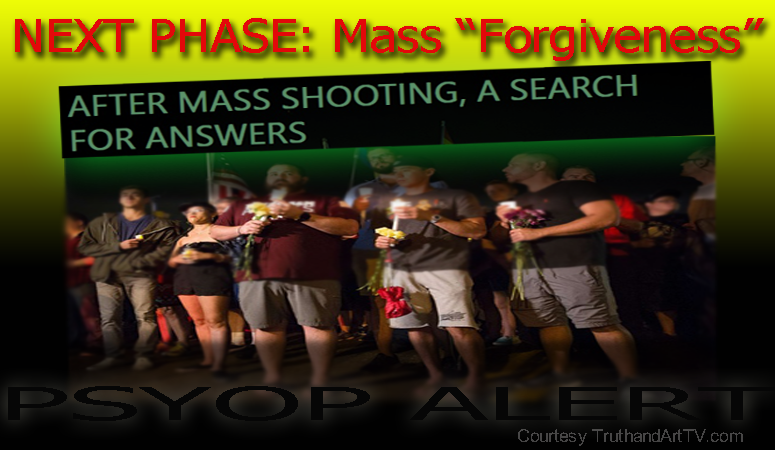 As a follow-up to my recent review of the Orlando "shooting", the latest in an endless string of staged-false flag mass shootings which show no signs of letting up, I want to bring attention to the sequence of events which now include the "love and forgiveness" phase which also plays an important role in these mass psyop events. What I've been calling for some time "Operation Northwood II" is back in full swing since the Hillary nomination was presumably clinched last week. And since the script is so familiar to us from seeing it so many times, let's continue analyzing in real-time what we are seeing. The recent headlines and images we are seeing the past couple of days tells the story of a "community" that is gathering together in unity, peace, love and spirit of "forgiveness" to look at the bright side of this tragedy. Expect to see and hear a lot more of this on TV and mainstream media. 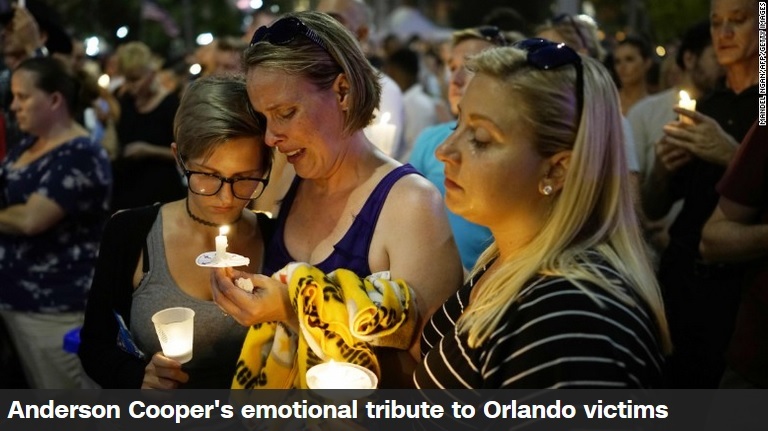 In fact, in this latest post-false flag psyop peace and love story CNN's Anderson Cooper offers an "emotional tribute to Orlando victims". Anyone falling for this is being fooled. Cooper has a long history of lying and going along with state sponsored terrorism and psyop events. Let's not forget the "Anderson Cooper loses nose" green-screen event in the post-Sandy Hook period of a few years ago. This is all part of the new "peace and love" new age-like spirit of the new world order that goes hand-in-hand with Agenda 2030 "peace and prosperity" theme. A world where no one is ever angry or genuine. All is forgiven and forgotten (think Sandy Hook psyop) including and especially state false flag crimes and staged mass shootings. Specifically what this means is that if you are asking tough questions then you are not going along with "forgive and forget". Questioning the state and not believing that the shooting event is truly organic then is seen as a form of "harassment" (think Sandy Hook) and dishonoring the victim's memory (think 9/11). So let's beware of this fake grieving period. If there an important lesson to observe from the Sandy Hook psyop event it's that the "peace, love and forgiveness" theme is then used to set the stage for the fund-raising and the big sympathy $$ dollars that are probably already beginning to flow in. There is a lot of money to be made from these tragedies and the "forgiveness and love" theme is the perfect preparatory campaign for this sympathy and money phase. So as we observe these usual phases, few are even realizing just how fast this shooting sequence is going. Speaking of fast, I'm already labeling the Orlando nightclub shooting event as the fastest moving staged event we've ever seen. Is anyone noticing how fast they are moving with the usual script? The shooting just happened about 24 hours ago (from the time I started writing this) when no one knew anything whatsoever. Then in just 24 hours 50+ people are murdered without a single concrete eyewitness, Obama himself figures out that Islamic terrorists did it; everyone is conveniently locked-down even though the only shooter was already dead yet no one complains; doctors, congressmen and as mentioned even the president all make public speeches telling you who they think did it and all calling for more gun control. This entire event was quickly solved, evidence in, and the courtroom of public opinion deliberated in lightning speed. On top of that throw in the already proceeding, sympathy, ceremonies and donations $$. Soon we'll see the lawsuits $$ from the victims families against the maker of the supposed rifle used, the denial of the FOIA requests to see the surveillance videos and other evidences should anyone actually pursue this. Oh, and I forgot one more thing, the movie about the event, if necessary, will be waiting in the wings. Between now and then we might get some reminders of this story to keep it alive in your mind. This is their whole sequence. When it's all done push the repeat button and do it all again. Despite this simple and easily tracked and verified sequence of events, too many Americans choose instead to live in cognitive dissonance denying the reality around them. Too many Americans choose to accept the fictional reality presented to them. Sadly, they prefer instead to believe the lies they are told because it makes their life easier. My analysis of the Orlando nightclub shooting discusses several undeniable oddities; things that are being pushed on the general public that simply could never be. Yet I'm observing that even critical thinkers are accepting these oddities. This is not about defining whether people died, beware of this trap, it's about seeing that it was a staged event. It's about asking questions like how many shooters were there? How could one man kill that many people in such a short period of time? Where are the videos from all the cell phones? Where are the images of emergency workers doing their job? Did anyone die at all? The story doesn't add up and this really matters. I'll challenge anyone to provide a shred of evidence that any part of this event is real. Perhaps it is, it's up to you to prove it. As soon as people do this we can then reconsider what type of false flag we are dealing with. The problem is we are becoming so accustomed to the script that too many of us don't realize just how far removed from reality these events really are. Instead, we find ourselves reasoning the other way around. Many people today subconsciously are trying to squeeze the story into their reality instead of analyzing and comparing it against reality itself. 1- The Orlando event is moving uncharacteristically faster than any previous staged shooting event. 2- Everyone seems to be playing their role on cue without regard to how predictable and phony their roles are. 3- Aspects of this recent Orlando nightclub event are so phony that even critical thinkers seem too mentally exhausted to question the reality of if so they are blindly accepting the psyop deep down not realizing why they are accepting this. 4- The event sequence mirrors previous events while seemingly compensating in areas where previous staged events lacked convincibility and genuineness. Some examples are- Whereas in Sandy Hook the blood and bodies were ignored, in this latest event reporters made sure to mention the blood and bodies (although they didn't bother to show us the proof of course). Also the shooter didn't change race and gender in the first few hours like we saw in San Bernardino. The lack of public outrage is very striking to me and perhaps that's the point. Love forgive and forget, as in literally forgetting who did this. Keep your mouth shut, become a lover and move on or get out of the way- the way of the new world order plans for a futuristic society of zombies who believe everything they are told. This new forgiveness and love psyop, instead of being angry and asking tough questions, is exactly what the ruling elite need in order to get away with their crimes forever. Are we going to let them get away with this? Is there anyone who thinks it is wrong to question the police, the Congressmen, the President, the mainstream media and the pundits? Are you afraid to stand alone and call the Orlando shooting just another psyop staged event? If so, then you are defeated. You are under their spell and you have fallen asleep again. Good luck. No one said this would be easy. We are in an information war and we are almost one year removed from Operation Jade Helm and the stated goals of "mastering the human domain". I urge all truth seekers to be vigilant more than ever before and not believe what you are seeing on TV. It's all lies. The magician is making his moves. Eyes open!